You know you wanna run it. The first time I did it, I was in my early 30s. I hated every minute and vowed never to do it again. The second time I did it was twenty years, a marriage and two kids later. I was 51, needing something to build bones and cardiac strength. So, I bought some cheap shoes at Target, put on shorts and a cotton T-shirt, loaded a C25k (“couch to 5k”) running app on my iPod and got off the couch. But I did it. And I hated it. I’m not big on faith, but I put my faith in the program and worked it, motivated to not wind up like my mother with emphysema, osteoporosis and dead at 73. You start the program easy, with a short “run” consisting of intervals of walking interrupted by followed by shorter intervals of running. Walking, I was good at. Running? Were she alive, my grandmother could have been my running buddy as we shuffled along a little slower than, well, a couple of ninety-year old women. That first run segment was only 60 seconds long, but I couldn’t wait for the 90-second walk that followed. I kept at it, though. My husband was proud, but I still hated it and thought lovingly of my couch every time I dragged myself out the door. I owe my dog a debt of gratitude for hogging my favorite seat. Then, it happened. I started loving running. Even though I was slow, I was still faster than everyone sitting at home watching “Survivor.” I was the survivor! I was mighty! I was a runner! I started hanging out at running stores. I bought running shoes—real running shoes. I bought running shirts (they wick sweat! ), running shorts (they wick sweat, too! ), running skirts (they hide hide sweat!). When the weather turned nasty, I bought running pants. I even asked for, and received, a pair of quilted thermal shorts to keep my buns toasty in the winter. I had all this stuff, but I was still missing the promised energy and endorphins. Again, I put my faith in the running. Two years later, I was booking miles at a time, without a single walk break, and still hadn’t had a runner’s high. Feeling accomplished? Yup. Euphoric? Nah. But I still loved running, even without the high. 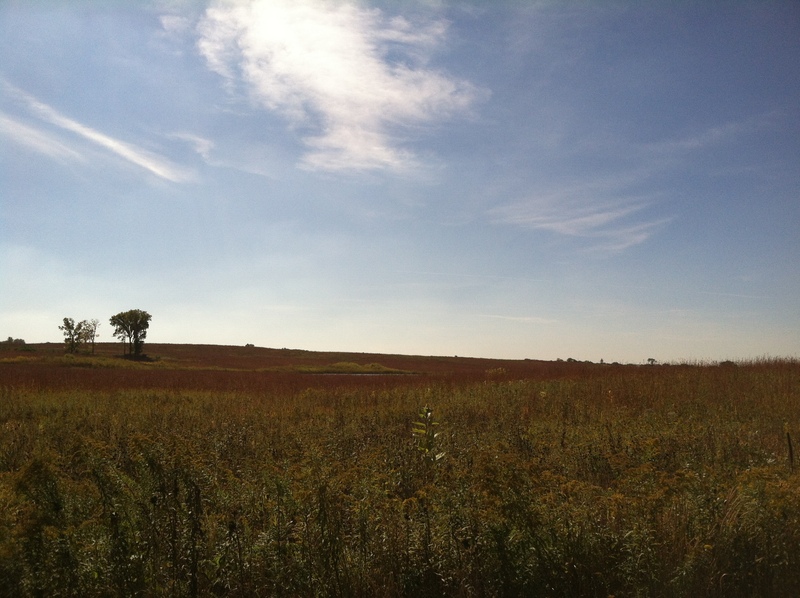 Then, at the end of a six-mile run, coming down a hill on a prairie trail near my house, it came. As I looked out over acres of Big Blue Stem grass, glowing copper and rose under a pristine blue sky, I felt it…a feeling of exaltation better than any hypomanic state. And a deep connection to my mother, born in October, when the prairie burns with the colors of a perfect sunset. I run because it’s good for me: it builds my bones, strengthens my heart and gives me energy. It clears my head when I’m down while a more upbeat mood gives me the tenacity to go longer, farther. But, more and more, I run for the joy of the perfect moment when the run and I are whole. Standing in a place of strength and viewing your world through a filter of appreciation lends a refreshing perspective. Thank you for sharing such a lovely point of view. I’ll tell you a secret. I hate runners…but I know it is because I secretly just want to be one. I think I would benefit from it greatly, both physically and mentally. I have no excuse why I’ve never even tried it other than looking and feeling like a 30-something yr old fool who has never ran outside of childhood. And there is the always dependable “I don’t have the time” …which, as you know, truly is never not an excuse when you’re a parent. I started running at 51 years old. You are right; you have no excuse. Go to the Runner’s World Facebook page and like it. You’ll get lots of encouragement. I’ll give you encouragement, too. If I can do it, you can!